Compiled by John K. Smith & Colin M. Linwood and self published as a thick, spiral bound A4-sized paperback in 1997. 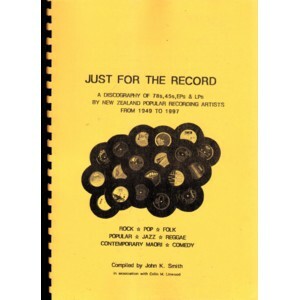 This is a listing of almost everything released on vinyl in New Zealand by New Zealand bands & artists from 1949 to 1997. It includes rock, pop, folk, jazz, contemporary Maori & comedy titles and gives very brief biographical details (with lineups), full track listings, catalogue numbers and release dates.